Croatia 2018 World Cup kits for Dream League Soccer 2018, and the package includes complete with home kits, away and third. All Goalkeeper kits are also included. This kits alos can use in First Touch Soccer 2015 (FTS15). Both uniforms have the same design, with a headline shirt that presents the traditional board design with red and white squares this time larger and with blurry edges, leaving the sleeves in red and back in white like the shorts. The visiting uniform, on the other hand, is black with and is combined with dark blue for the pictures on the front of the shirt. 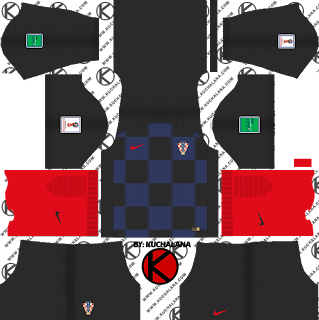 2 Komen untuk "Croatia 2018 World Cup Kit - Dream League Soccer Kits"